The Second Karmapa was born in Kyil-le Tsakto in the Dege district of Kham, into a noble family of yogis believed to be descended from King Trisong Detsen. He was a child prodigy who could read and write by the age of five, and who already had a broad and profound knowledge of Buddhist philosophy and practice before the age of ten. At the age of eleven he took ordination and was named Chökyi Lama. On his way to Central Tibet for further education, he encountered Pomdrakpa, the first Karmapa’s spiritual heir. In perfect accord with the letter given to Drogon Rechen by the First Karmapa, and through very clear visions, Pomdrakpa realised that the child was the reincarnation of Dusum Khyenpa. Pomdrakpa conferred on the young Karma Pakshi all the transmissions and empowerments, formally passing on the complete Kagyu lineage. Among his other important masters were the third and fourth abbots of the Nyingma monastery of Kathok, in southern Dege. 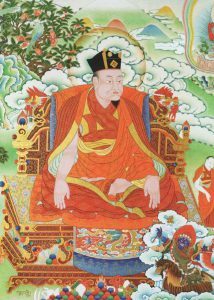 In addition to giving him teachings, Pomdrakpa also directed his disciple to go into meditation retreat. In accordance with these instructions, Karma Pakshi spent much of the first half of his life diligently practising in retreat. Later in his life he travelled throughout Tibet, China and Mongolia. He was active in restoring monasteries established by the First Karmapa as well as building new ones. He is also famous for having encouraged the melodious chanting of Om Mani Peme Hung amongst the Tibetan people, and wherever he travelled he attracted large crowds. He then travelled to Tsurphu, the main seat of the First Karmapa, where he remained for several years. While residing at Tsurphu, he received an invitation from Khubilai, grandson of Ghengis Khan, who had heard of Karma Pakshi’s substantial reputation as a worker of miracles. Therefore, at the age of forty-seven, he embarked on the long journey to visit Khubilai’s court. While there, Karma Pakshi performed many spectacular miracles and played an important role as a peacemaker. Political upheavals and struggles for the succession of the throne of the Mongolian Empire meant that eventually the Khanate passed to Khubilai’s elder brother, Mongke. The fact that the Karmapa declined to stay permanently in Khubilai’s court, and that he eventually accepted an invitation from Mongke Khan, caused Khubilai to harbour some resentment. Karma Pakshi was received with great honour at Mongke Khan’s court, and was presented the Great Golden Seal of ‘Tishro’. The Karmapa participated in interreligious and philosophical dialogues and debates with other Buddhist communities, as well as Daoists, Confucianists and Nestorian Christians. After Mongke’s death, Khubilai finally became Khan and ruled over a vast Mongolian Empire. Although many years had passed, Khubilai was still displeased with the Karmapa’s refusal to stay longer at his court, and with his apparent favouring of Khubilai’s late brother, Mongke. Khubilai Kahn ordered the capture of Karma Pakshi and put to death a number of his followers. Despite the overwhelming forces sent to capture or kill him, the Karmapa continually thwarted each attempt with both magical power and compassion. It is said that it was these qualities that protected him and the Kagyu tradition from greater difficulties. As time passed however, Khubilai Khan had a change of heart and regretted his actions against the Karmapa. He confessed his misdeeds and requested the Karmapa to teach him. Karma Pakshi then returned to Tibet and directed the building of a Buddha statue at Tsurphu. When completed, the statue was well over fifty feet high, though was found to be slightly leaning to one side. In one of his most famous displays of siddhi, Karma Pakshi sat in the same position as the statue, also leaning slightly. As he straightened his posture, the statue simultaneously righted itself. His most renowned students were Orgyenpa Rinchen Pal, Tashi Drakpa, Drakpai Pel, and Dengom, who built the Lhakhang Chenmo at Tsurphu. Various histories have stated that the Karma Pakshi composed over one hundred volumes of texts that were kept in the library at Tsurphu. Very few have survived however. Before his Parinirvana at Tsurphu in 1283, Karma Pakshi disclosed details concerning his rebirth as the next Karmapa to his main disciple, Orgyenpa. Orgyenpa succeeded him as abbot, and later found and educated the Third Karmapa, Rangjung Dorje.